In the first part of our guide to public art this autumn we look at London’s fabulous temporary structures and city sculpture trails, as well as an exhibition exploring memorials and how we live with them. It’s autumn and here at Artichoke we’re reminiscing about the glorious and memorable summer, looking back in particular to early June and PROCESSIONS, our mass participation artwork which transformed the streets of the UK’s four capital cities. Commissioned by 14-18NOW, tens of thousands of women, girls and those who identify as women took to the streets of Belfast, Edinburgh, Cardiff and London to mark 100 years of votes for women in the UK. Wearing either green, white or violet, the colours of the suffragette movement, together they appeared as a vast unfurling suffragette flag. One of the banners for PROCESSIONS. Banners will be displayed at various venues this autumn. Photo © Amelia Allen. 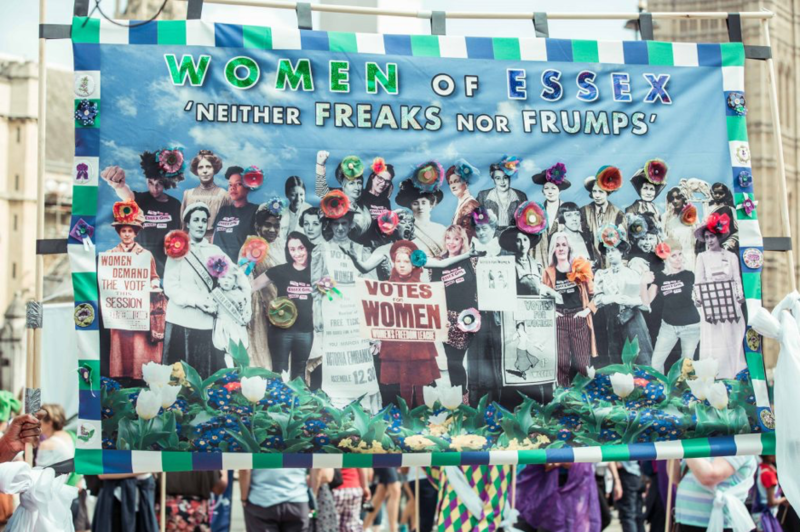 If you missed this once-in-a-lifetime event – or want to re-live the day – there will be a major touring exhibition of the one hundred beautiful banners commissioned as part of PROCESSIONS next June 2019 – watch this space for more details. In the meantime, you can see some of these on display at Coventry and Ipswich this autumn. We’re in the midst of planning for some exciting new projects including the 10th anniversary of Lumiere in Durham in November 2019. In the meantime, there’s a lot going on in the world of public art. Over the next few weeks, we’ll be sharing our favourite temporary exhibitions, one-off weekends and new long-term installations – all of which are free to enjoy. Lots of the summer exhibitions that you might have missed are still on during September and beyond, while October and November are great months to enjoy outdoor sculpture parks or public art at one of several city arts festivals. In Part 1, we’ll be zooming in on some of London’s high-profile public art installations and exhibitions that are continuing into the autumn. In Part 2, we’ll extend the spotlight to the whole of the UK, highlighting the many exciting and engaging public art events taking place all around the nation. Part 3, will look specifically at three of the UK’s forest sculpture parks – spaces to enjoy both art and nature at once, if the weather permits! You might have guessed by now that we’re huge fans of temporary transformations of the public space. Over the last few years we’ve created several ephemeral artworks that have created a memorable shared experience; projects like Temple by Burning Man artist David Best, who designed a 22-metre-high wooden structure in Derry~Londonderry in 2015, which ended, after seven days, with its ritual burning (not before 60,000 of the city’s residents had made the pilgrimage to visit Temple and leave messages inside). 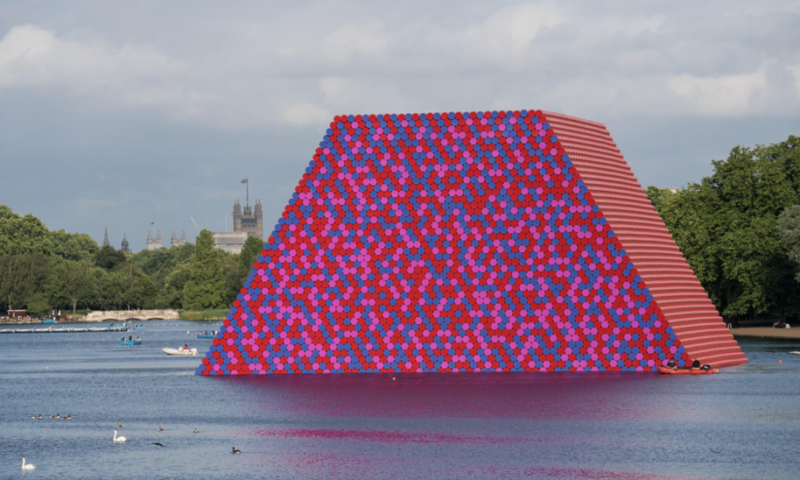 The London Mastaba is a similarly daring artwork that has certainly been a distracting presence in Hyde Park over the summer. If you haven’t yet seen it, it’s definitely worth hotfooting it to the Serpentine Lake before 23rd September, to marvel at Christo’s 20-metre-high floating sculpture, made from 7,506 stacked oil barrels painted red, blue, pink and white. The work takes the form of a mastaba, an ancient Egyptian tomb, and its flat roof and sloping multicoloured walls bring colour and exoticism to the serene park. Christo has vowed to fund ecological improvement works to the Serpentine Lake once the sculpture has been removed, to deep-clean the water and provide new habitats for wildlife. Frida Escobedo’s commission at the Serpentine Pavilion. Photo © 2018 Norbert Tukaj. 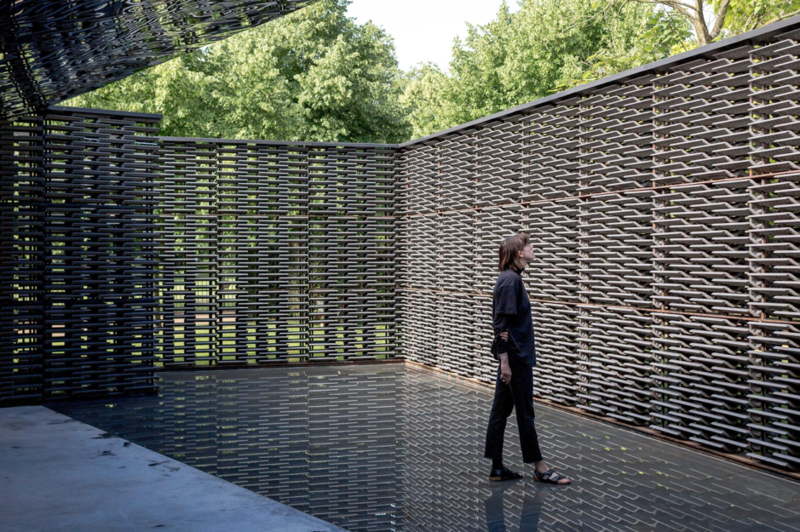 Just a barrel-roll away, in Kensington Gardens, and on until 7th October, is Frida Escobedo’s inspiring installation for the annual commission at the Serpentine Pavilion. The prize-winning Mexican architect is the youngest architect to have designed for the Pavilion. Taking inspiration from both Mexican courtyards and the Prime Meridian in Greenwich, Escobedo’s structure focuses on light, shadows, reflection and refraction. A graduate of Harvard’s Masters programme in Art, Design and the Public Domain, Escobedo has become known for her work on social housing as well as for high-profile urban cultural architecture projects and public art, such as her 2015 Aztec-inspired installation in the V&A courtyard in London. 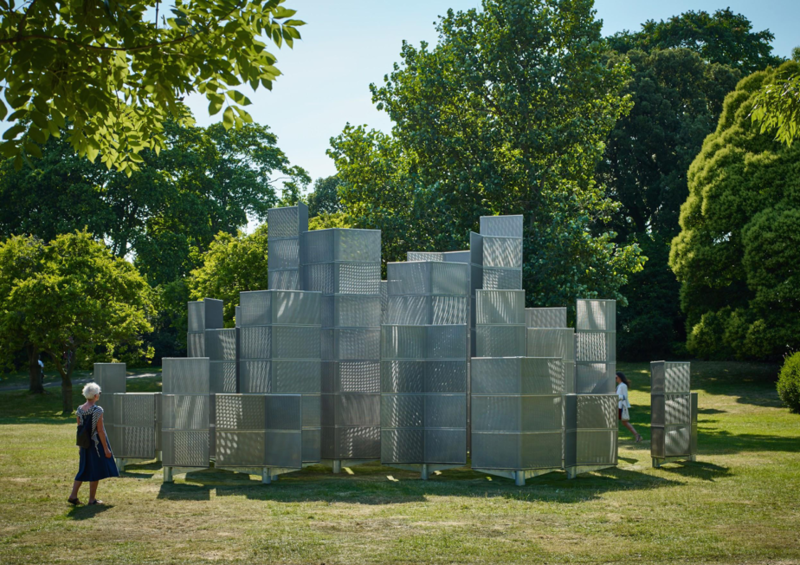 Over in Regent’s Park, and also on until 7 October, is the Frieze Sculpture Park, exhibiting a collection of world-class artworks in similarly bucolic urban surroundings. Now in its second year, the three-month sculpture park – curated by Yorkshire Sculpture Park’s Clare Lilley – features works by 25 contemporary and modern artists from around the world, including Rana Begum, Dan Graham, Conrad Shawcross, Monika Sosnowska, Tim Etchells and Tracey Emin. The last two artists have both had work featured at Lumiere Durham and Lumiere London in the past couple of years. Frieze Sculpture Park is the perfect place to enjoy an after-work picnic or stroll through on a Sunday. Conrad Shawcross, Optic Labyrinth (Arrangement I), 2018, Victoria Miro, Frieze Sculpture 2018. Photo © Stephen White; courtesy of Stephen White/Frieze. For city sculptures in more urban surroundings, take a walk around London’s ‘Square Mile’ to enjoy the latest edition of Sculpture in the City, an annual selection of outdoor artworks commissioned by the City of London Corporation, in partnership with local businesses. The 19 sculptures selected for the eighth edition – on display until April 2019 – include works by internationally known artists including Gavin Turk, Sarah Lucas, Lynn Chadwick and Jake and Dinos Chapman, all set within the iconic surroundings of the capital’s financial district. Visit the website to view the sculptures’ locations on a map to help you plan your route. Trafalgar Square’s Fourth Plinth, funded by the Mayor of London and Arts Council England, is one of the world’s most-famous platforms for public art. The Fourth Plinth is very dear to our hearts, as it was the setting for our ground breaking project One & Other by Antony Gormley. For 100 continuous days and nights in the summer of 2009, 2,400 ordinary people from across the UK installed themselves on the Plinth – each person for one hour at a time – filling Trafalgar Square with the voices and views of modern-day Britain. The project not only provided a snapshot of British society but was also a poignant representation of humanity itself. Since 28 March 2018, the Fourth Plinth has been occupied by Michael Rakowitz’s The Invisible Enemy Should Not Exist, a four-metre-long sculpture representing the ‘Lamassu’ statue – a protective deity with a bull’s body, eagle wings and a human head – that stood at the Nergal Gate of Nineveh (near modern-day Mosul) from c.700 BC until 2015, when it was tragically destroyed by ISIS. Michael Rakowitz’s The Invisible Enemy Should Not Exist on the Fourth Plinth. Photo © Gautier DeBlonde. 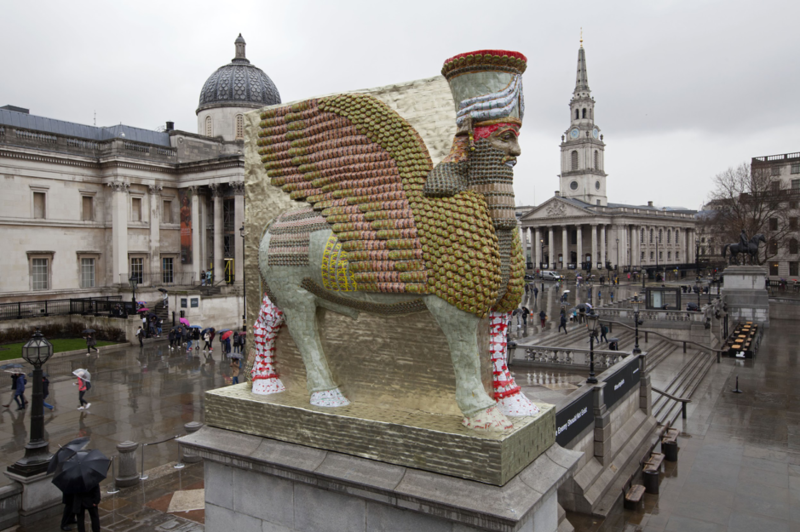 Made out of 10,000 Iraqi date-syrup cans, the artwork offers a powerful commentary on the world today, with the cans alluding to a hugely important national industry that was destabilised by the US-led invasion of Iraq in 2003 – a war that also led to the destruction of the original Lamassu 12 years later. The work is part of an ambitious long-term project by the Iraqi-American artist, he is aiming to reconstruct some 7,000 objects looted from Iraq’s National Museum. The 12th work to appear on the Fourth Plinth since commissioning began in 1998, it will remain in Trafalgar Square until March 2020, acting as a protective figure for London dwellers and visitors alike. Make sure you pay this impressive statue a visit! If you’re still looking for your PROCESSIONS fix, join us at the newly relaunched Aldgate Square on 20th October for a special one-off event. Hidden Voices: PROCESSIONS in the City is a sound and light installation created from stories, words, interviews and workshops with women from the Aldgate community. The final event in the City of London Corporation’s Women, Work and Power season, we’ll be unveiling the hidden voices and histories of local women. This event will celebrate 100 years of women voting in the UK and present a “portrait of women”, past and present. Make sure you’re signed up to our newsletter to find out more, there might even be some beautiful PROCESSIONS banners on display. 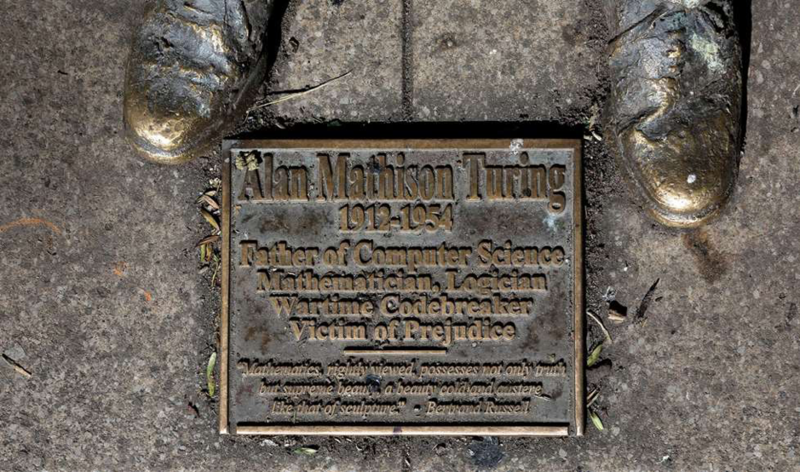 Plaque on the Alan Turing Memorial, Sackville Park, Fairfield Street, Manchester. Lastly, if you’re looking for something to do this weekend, be sure not to miss the exhibition Immortalised (on until 16th September) at The Workshop in Lambeth – part of a programme of activity organised by Historic England to explore how, why and who we, as a nation, remember in our streets, buildings and spaces. The free exhibition takes the visitor on a journey, asking questions like ‘why do we remember?’, ‘how do we live with our memorials’ and ‘who do we want to remember and how?’. The engaging display features images of London’s Blue Plaques and other memorials, new and historic statues, lesser-known tributes, and maquettes for memorials that haven’t yet been made, such as Les Johnson’s Enslaved Africans Memorial Maquette of 2007. The exhibition launched on 4th September with an event and conversation between our Director Helen Marriage and the Turner Prize-winning artist Jeremy Deller, discussing what public memorials of the future will look and be like, and the role of art and culture in creating a legacy. We’ll be sharing an insight into the talk very soon, so keep your eyes peeled. We hope you’ve enjoyed the first instalment of our blog. We’ll be back soon with the next part of our UK public art journey.